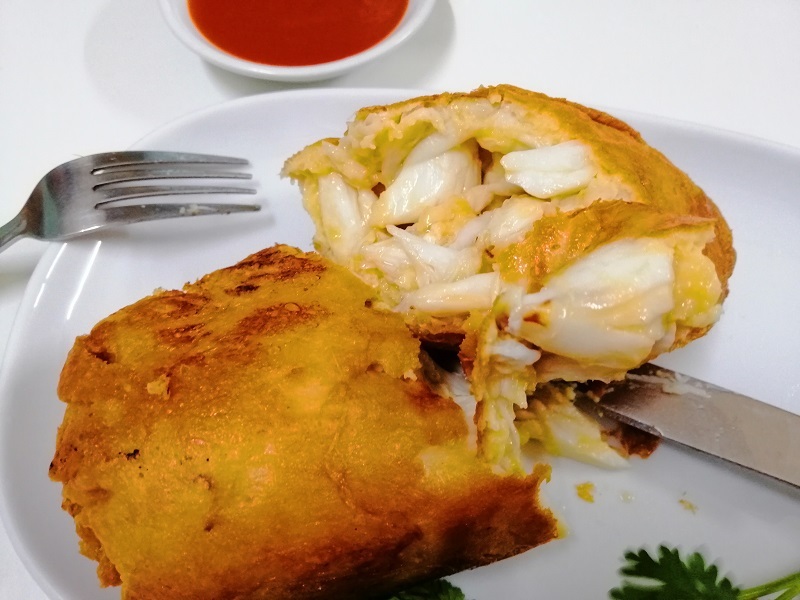 This crab omelet place with 1 Michelin star has been getting a lot of hype as the first and only street food to snag a star in the Bangkok Michelin Guide. The crowd waiting (in)patiently for a seat in Raan Jay Fai shows that people are still very willing to wait hours for a taste of their famous crab stuffed omelet. I made a booking via email and still had to wait 1 ½ hours to get my food. Some of the walk-ins have waited upwards of 5-6 hours! The wait is excruciating coz Jay Fai insists on cooking every single dish herself over a charcoal fire. 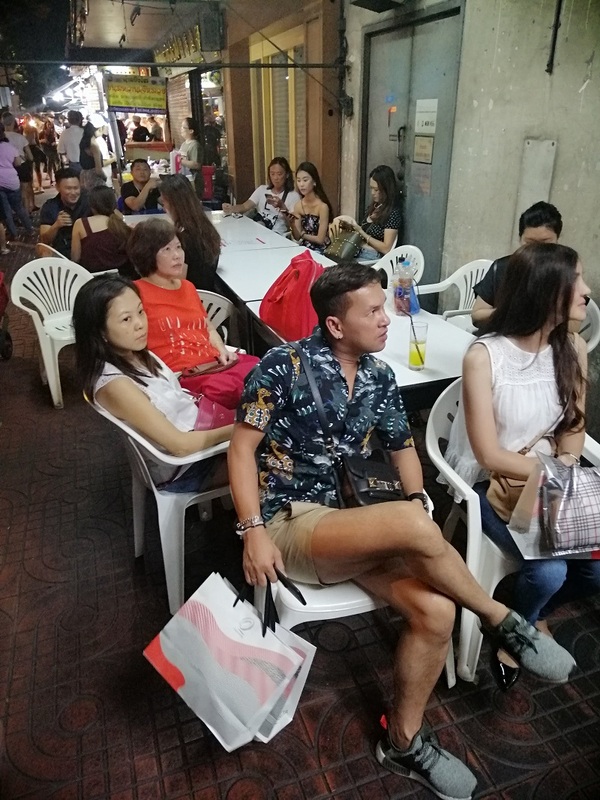 There was a Thai man who got rather irate at a group of Caucasians who let another two late-comers join them. They were not part of the original group. However, the well-run front of house politely let the interlopers know they can’t stay. 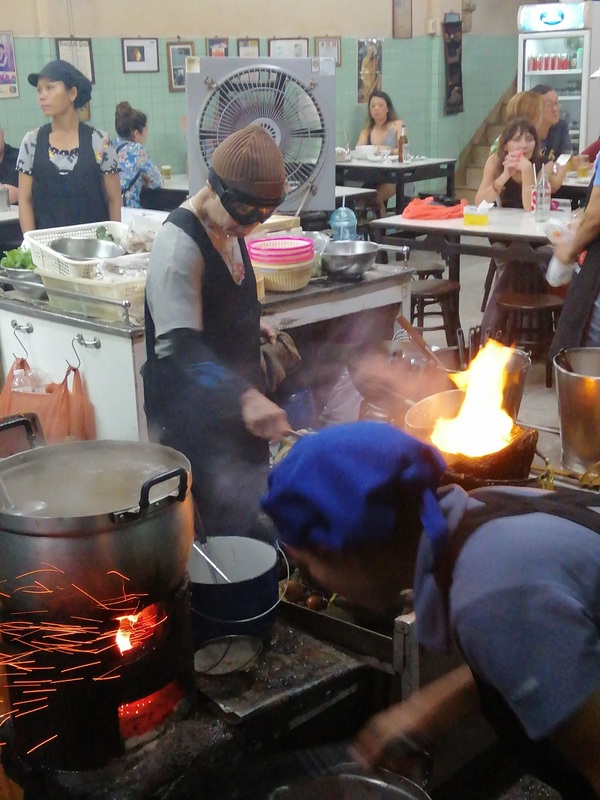 The service side is run by Jai Fai’s sister (as heard from Marine, daughter of Jean-Michel Lorian who runs the 1 Michelin Star J’aime) and she is unfailingly warm and friendly. People who walk in are expected to stay in the area as she’ll call their numbers every hour on the hour. You’ll forfeit your spot if you leave or fail to respond. There are several tables and chairs outside for people waiting. You can’t enter the premises until your number is up. I had to wait outside until my 8 pm reservation too. You’re only seated once your timeslot is available so the inside is for customers about to eat only. I thought that was a great way of making it uncluttered. I can see my name and email at the reservations list. They’ll ask you to show the original email to confirm that you’re indeed who you say you are. There must have been cases of people trying to pass themselves off as someone else in the past due to the exceedingly long wait. 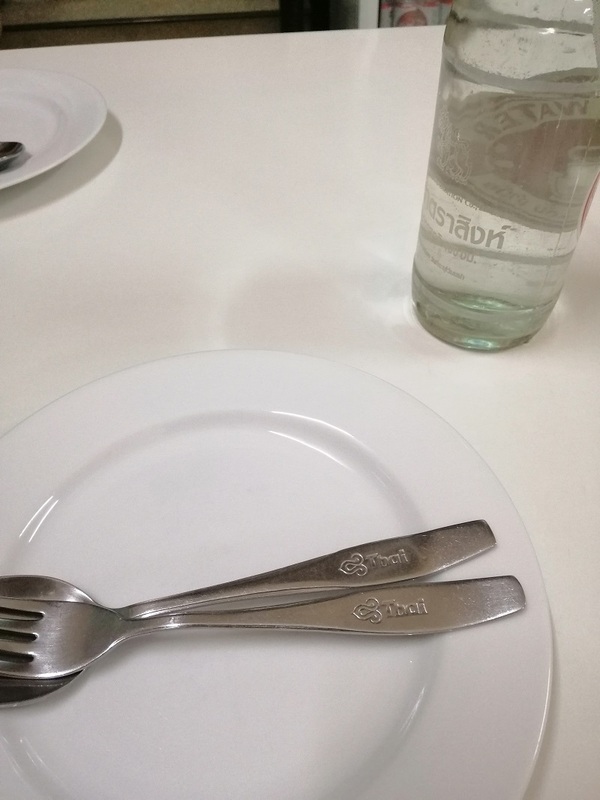 It’s probably the only Michelin starred restaurant in the world to use cutlery nicked from Thai Airways though. I thought that was pretty funny. I ordered their famous crab omelet. There are no more small and big sizes, it’s now 1 size only for 1,000 baht (RM 126). It came beautifully brown and glistening. 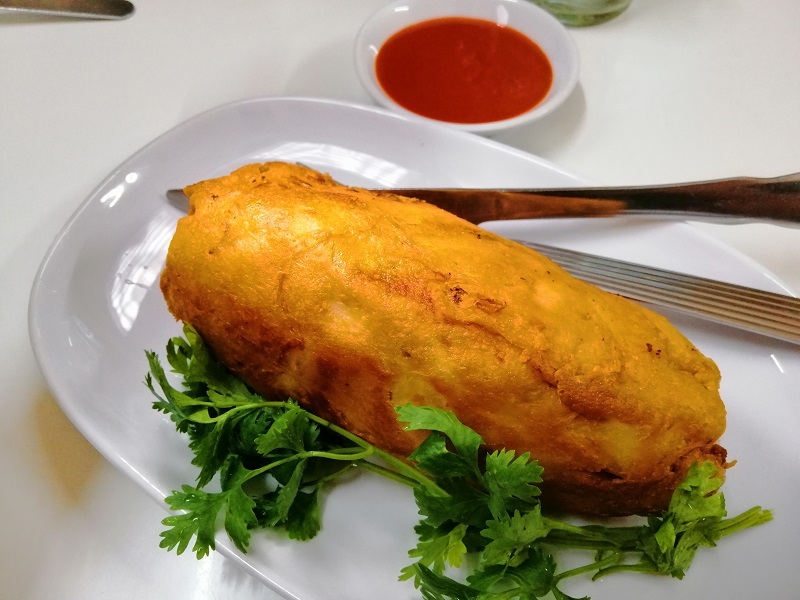 Jay Fai only uses 2 eggs in this omelet, the rest of the bulk comes from crab meat! There are no fillers either so everything inside this huge roll is de-shelled crab meat. I thought it’ll be very oily since it’s deep fried in a wok filled with oil but it’s not. The crab meat inside is still succulent too. It goes so well with the slightly acidic sweet chilli sauce they serve on the side. I really enjoyed this dish. The luxury of eating massive amounts of crab meat without having to go through shells is not something to be scoffed at. I felt like a maharaja who had servants de-shelling the crab for me. It tasted delicious too. 10/10. I also went for the Drunken Noodles (500 baht or RM 63). 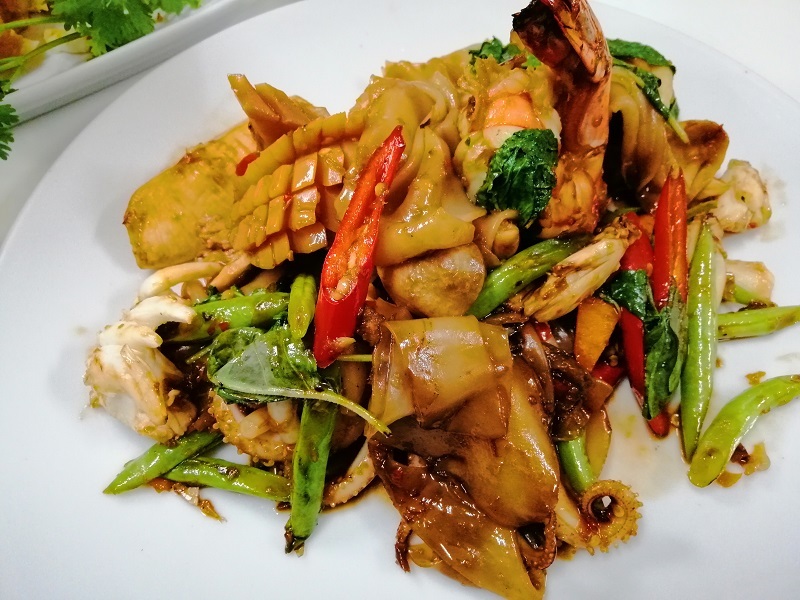 These are flat pieces of chewy noodles cooked with tender squid, delicious crab (the same de-shelled crab found in the omelet), soft cuttlefish, juicy huge prawns and toothsome mushrooms. It’s a seafood bonanza. I thought it tasted good too, for the first few bites at least. Then the sodium hit me. This dish is unbearably salty! This is coming from someone who smashes 3 packets of Mi Sedaap in a single sitting so when I say something is salty, it probably means it’s excessively so. I had to struggle to finish eating this. It’s good but Jay Fai should really work on the sodium content. Raan Jay Fai is one of those Bangkok experiences you have to go through (like Gaggan). 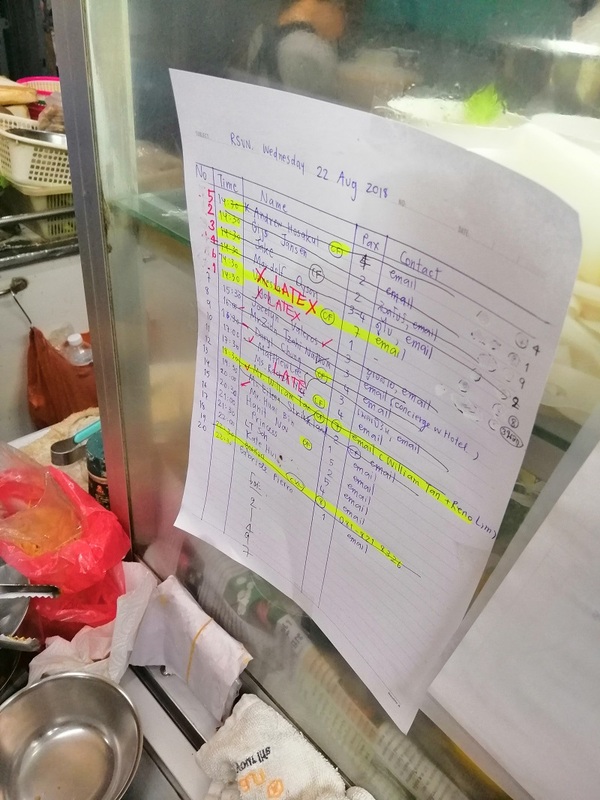 The bill came up to 1,525 baht (RM 192) with the crab omelet, drunken noodles, and water to drink. I enjoyed the camaraderie that comes with waiting with total strangers. I had a nice long conversation with my tablemate, an Indonesian programmer working in Africa. One highlight was a Caucasian girl clapping her hands excitedly when her crab omelet arrived. “I’ve never waited for something this long”, she exclaimed. She’s been waiting since 3 pm and it was 9:30 pm when her food arrived. “Let’s order another beer to celebrate,” she proclaims and the whole restaurant started cheering whenever everyone got their food, including me. 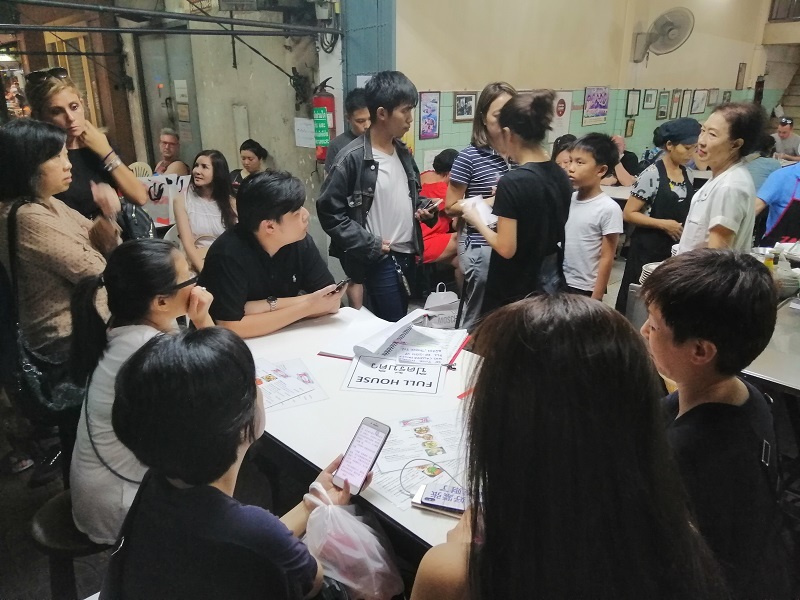 I thought that was pretty cool, a shared bond that you’ll only get after hours of being cramped together in a small non-air conditioned shop lot on a hot Bangkok night. Gosh. Looking at those crowds, I wonder I have the patience to wait or not. But your crab omelet indeed looked heavenly and nice. For that price, it must be really good.